Phuket Tour Guides offers, luxury tailor-made private tours. You will be personally assigned your own Phuket Tour Guide, who will ensure that your holiday is truly memorable. All of our tour guides are highly experienced local residents, who are fluent in both English and Thai. They are all extremely knowledgeable in everything Phuket. Therefore, for anything that you would like help or assistance with simply ask your expert guide. This is perfect for business people, independent travelers, couples, families and also seniors. The tailor-made option ensures that you can do and see everything that you would like to. You no longer have to tour Phuket in large groups, with people who have different interests and preferences. With our luxury service you will have the undivided attention of your personal tour guide. You are guaranteed to get the most from your Phuket tour. Your guide can advise you as to the best places to visit, the best Phuket hotels, the best Phuket restaurants, the best private tours, etc. Anything that you require, your tour guide can assist you with. You may visit many areas and attraction that are not included in group tours. This is what makes this service so unique. With this private service, you can tour Phuket as you require. This is a wonderful opportunity to learn more about Phuket and to experience everything. Phuket Tour Guides can organise chartered boats for you to explore the many outlining tropical islands in style. You can tailor your day to meet your exact wishes. Why Choose Our Private Tour Guide Service? We offer a first class Phuket tour guide service. 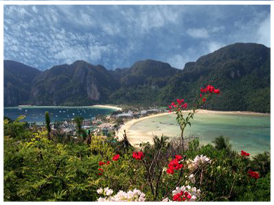 You may tailor your Phuket tour to your exact requirements. All Phuket tours are customized by you to meet your needs. Experience "off-the-beaten-track" touring throughout Phuket. Enjoy a VIP sightseeing tour of Phuket. Examples Of Your Private Services? We can charter private boats and yachts. Enjoy private tours in Phuket. Professional English speaking tour guides. VIP Phuket Tours - Luxury tours tailored to your requirements. We are the Phuket experts! Anything that you require during your time in Phuket, please let us know and we can organise it. If you have any questions or would like more information, please contact us. Experience a professional private tour during your stay in Phuket.